Periods: a taboo topic to discuss, but there is no shying away from them. It’s a cycle of fighting off dreaded cramps, battling mood swings, and worrying about facial outbreaks – unfortunately, periods are a natural part of womanhood. Going beyond the need to dismiss the claim that tampons are a “luxury item”, we ask how many of us class sanitary products as essential? For many homeless and vulnerable women across the city of Manchester, access to sanitary products is denied. This is period poverty. ‘Once a Month’ is a Student Action project, set up by students Gaby Hartfield and India Burgess to fight period poverty in Manchester. I spoke to Gaby Hartfield, a second year Law and Politics student about the ‘Once a Month’ project. Gaby is the training co-ordinator for Student Action, and shares the role of Homelessness Projects co-ordinator with India. The girls set up ‘Once a Month’ in September. Their vision is to fight period poverty by providing sanitary products to vulnerable women across Manchester. 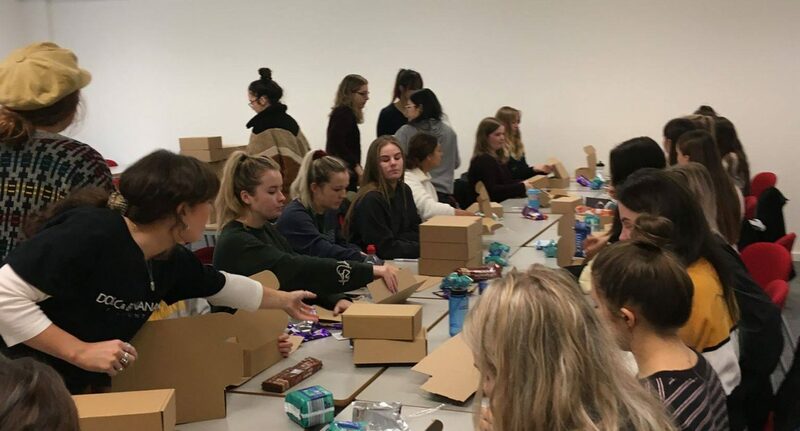 Through the packaging and distribution events they run, they hope to create more awareness within the student community about the extent of period poverty and its effects. Thus far, Gaby and India have hosted a packaging event in November, with a Christmas session scheduled for 12th December. She went on to explain how they are excited about the upcoming Christmas project. With an aim to increase the number of boxes packed with the help of even more volunteers, there is no doubt the project is already a success. Each box will contain the basic contents with some festive treats such as Christmas chocolates and hand-written cards. The project is growing as Gaby and India reach out to other charity organisations in the new year. In addition, they have organised a Valentine’s Fundraiser; this will include a bake sale where people pay with sanitary products rather than money. The community needs to tackle the problem of period poverty. Many homeless charities hand out razors and condoms but there is seldom an allowance for sanitary products. However, the homeless community isn’t the only place period poverty occurs. In 2017, more than 137,700 girls missed school because they could not afford sanitary products. Gaby would like to see the education system tackling the problem by creating awareness within its curriculum. ‘Once a Month’ is a compassionate project set up by women for vulnerable women. Something as simple as sanitary products can go a long way in easing the struggles of women who sleep rough. A little help can have far reaching effects; Gaby and India encourage both men and women to get involved in the project. The Facebook group called ‘Once a Month – Student Action Project’ provides further information. Tune in to BBC Manchester this Thursday 29th November at 7pm to listen to Gaby and India talk about the homeless projects they run.